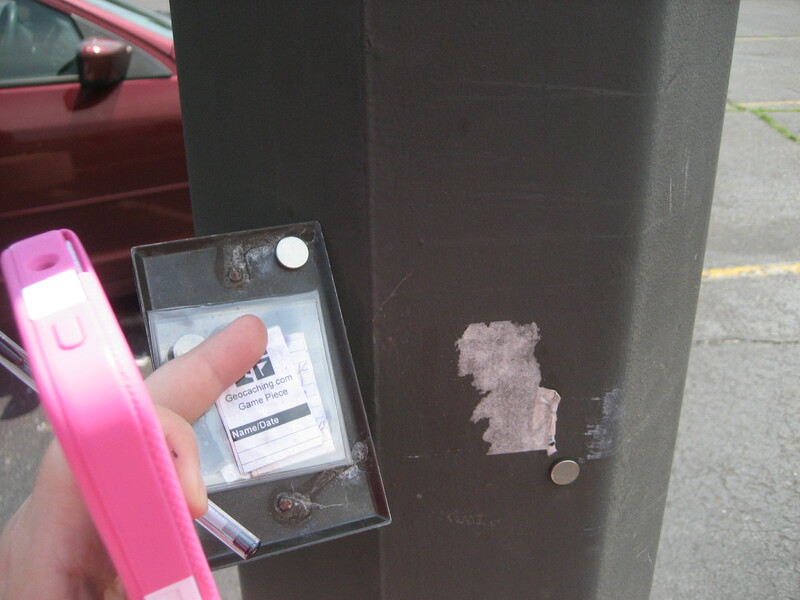 Reminder – Post your experiences on finding a geocache on August 16th. Linky link. Prizes. All good fun. And in between now and then I am going to show you some examples of geocache hunts and finds I’ve had recently, so you know what you are looking for. I want to show you an example of a Park & Grab we found. We were on our way home and I decided we were going to find a cache together. There was one pretty close by #GC33DPA – The WB. Remember on the app, you are the blue dot heading towards the green map pin. A park & grab is generally a quick find near a place where you can closely park and walk to the cache. The description told me it was magnetic and the hint told me it blended in well. Psych! It is held onto the pole with magnets and the paper inside is the log that I had to sign. I was also told in the description to BYOP – Bring your own pen – since there was no room to hide a pen or pencil in this cache. Now, you don’t think I did that all alone, did you? Complete family effort!! Geodogs and Geohubs in tow. It was well over 90 degrees that day, so I didn’t make them get out of the AC. And no, we didn’t drive with them crawling all over like that. Rock on Geodogs! Tricky! That’s a good kind of starter cache for a beginner! Like me!! This looks ike lots of fun, we will be watching the beginning at least. Mom goes on vacay from school and starts staycation with us August 13. We love that last shot of you in the car, adorable! Awesome! 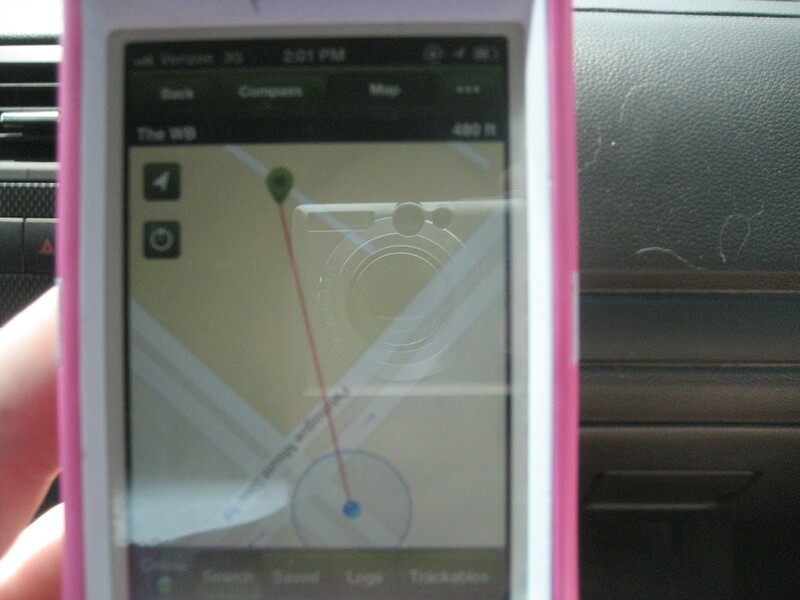 I’ve been reading up on geocaching and checking out what is close by for us to try and find. We have lots to choose from. Thanks for another exciting thing to do with our pets!! Now that is clever. Love the final picture. That magnetic cache was so neat. 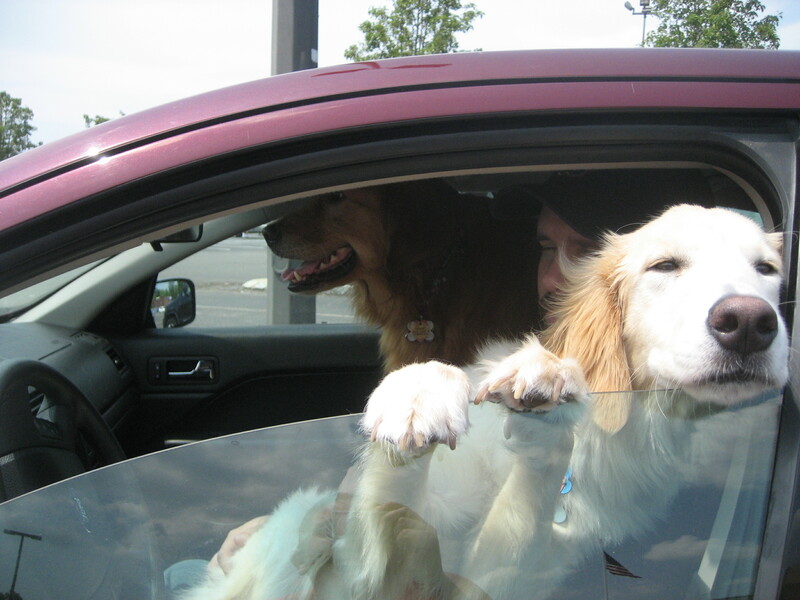 I like how the dogs were enjoying all the air conditioning in the front seat of the car. Did mom person have to sit in the back seat? That is way cool and clever. We hope you have a serene Sunday and take some time out for some big easy today. WTG the family who GEOs together has the most fun! Do folks have to get permission to hide/attache caches around their city? There’s a process to hide one. You don’t need permission, but you have to follow the rules. Love the last pic!!!! Two happy pups indeed!!!! What great camo for that cache. 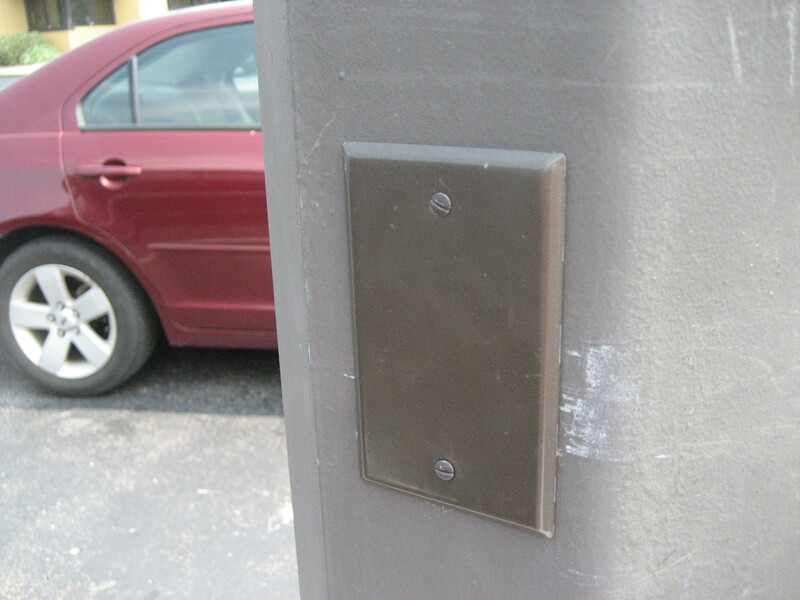 Wow, I never would have thought that the magnet thingy would be the geocache! That’s very cool! Very fun, and the team effort makes it even more so! O…M…D that is SO cool and SO tricksy!! We LOVE it!! Chuck…you look hot and tired bru…we hope your momma treated you to something cool and delicious when you got home! That was clever to “hide” the cache in plain sight like that! We have our post all set up! What a great find you made!!! We keep trying to tell Mom we have to try this. We can’t wait to see all the posts. Hey, that’s pretty cool, Charley! What a great hiding spot! And, it sure looks like your snoopervisors were keepin’ a good eye from the cool car!! LOVE that pic!! Very cool! one of your earlier caching posts got me and my mom into it 🙂 we went out today and were able to make a find. We think yours would have stumped us. We’re gonna remember that trick. Awesome! Glad you enjoyed playing!! A park and grab! That would be the perfect cache for my dad. Best in front of my crib – he is such a lazy guy. That looks like fun! What a great find. We have missed you – hope all is well lately! We will be back again soon! So cool! I’m starting to catch on more to how much fun this must be!